Running behind on your cleaning duties? By dedicating only 10 minutes a day to snazzing up your space, you can keep it clean and clutter-free. Or, use some of these tips when guests are on the way and time is short. Set a timer. When you know a timer is ticking, you're less likely to waste a minute or two answering a text or other time-sucking distractions. Set a 10-minute timer on your phone, and go! Work outwards in. 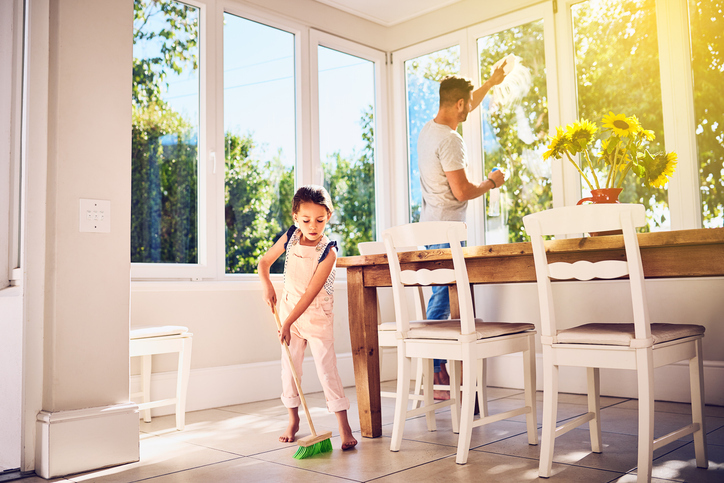 Start at the perimeter of a room and work inwards, stashing clutter and picking up clothing or other items that haven't been put away before you get to things like vacuuming. Pick a room. The 10-minute game is easiest if you go one room at a time. If you plan to do the 10-minute game daily, schedule out a room each day, i.e., bathrooms on Monday, kitchen on Tuesdays, etc. Designate a random object basket. Do you constantly find random, homeless objects lingering in your space? Grab an empty laundry basket and spend 10 minutes running through your home filling it up with things that don't belong. The next day, spend 10 minutes finding homes for each of these items. Enlist help. When all hands are on deck, 10 minutes goes a long way. Enlist the help of a roommate, spouse or kids to divide and conquer in 10-minute blocks.